There IS something we can do, if we only look to Hollywood Christmas movies and TV shows from the twentieth century. Let’s run through some instructive examples, OK? Problem: insufficient snow at a winter resort. This is a major fear in places like Colorado, which depends on winter sports, especially skiing, to propel winter tourism. What do you do? Well, you remember how much you loved the Old Man who owns the resort back when he was your C.O. Solution: Convince an army buddy to go up to Vermont, grab a sister act, and put on a show, inviting all your less talented army buddies to book tickets to your dinner theater. Magically, the snow will begin to fall by the end of the show, saving the Old Man’s retirement and the local ski industry. Problem: Unseasonably warm weather threatens end-of-year retail earnings; also, Santa Claus depressed. This is what happened in the east in 2015, with temperatures in the 60s F in December w/r/t the weather; not sure about Santa’s mental health last year. But warm weather in December is a problem. People don’t think winter is coming or Christmas is near, so they don’t buy new coats, sweaters, or Christmas gifts, which threatens profits in Q4. 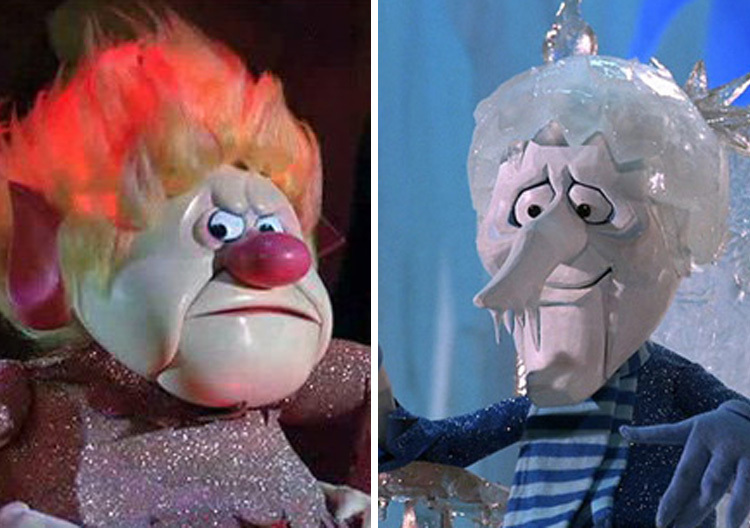 Solution: Mother Nature to call a meeting with her feuding sons, Snow Miser and Heat Miser. They can work it out in a few songs while Santa gets in touch with some of his stakeholders, who reassure him of their belief in him, and also a medical workup and some antidepressants. Problem: Winter storms threatens end-of-tax year philanthropy. You don’t think Santa gives away toys out of the goodness of his heart, do you? Well, what happens if Santa can’t follow-through with the distribution all of the donated gifts and toys by midnight, January 31? What if, for example, there were a massive, multiple-continent winter storm shutting down travel throughout the northern hemisphere? That’s a major tax liability! Solution: Find a flying reindeer with a fortuitous birth defect to lead the team powering Santa’s sleigh. Hope that in spite of a history of domestic abuse by his father and of bullying by peers, he will help out Santa anyway. If he does, he’ll go down in history. I’m sure I’ve missed a lot more examples–fill me in in the comments below! ← Teaser Tuesday: missing men & missing trousers! Whaaaaat? As I’m coping with below zero windchills and the promise of 8-12 inches of snow over the weekend…. Call in the Heat Miser! Or something. Or just put another sweater on and enjoy binge watching and day drinking. Or is that day watching and binge drinking? Both seem like decent options… Happy Holidays (pick you favorites) to all. 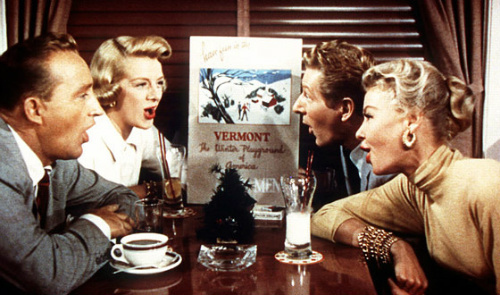 I think that “White Christmas” and “Holiday Inn” were two differently-edited versions of the same film. The Jimmy Stewart, slamming the car into the tree and walking grimly toward the bridge through the swirling snow is based on real meteorological and topographical facts, I can testify. Except with respect to the bridge part. Nothing to bridge in his neighborhood. I love Honest Trailers! My fave so far is Cinderella, the 1950 Disney cartoon version. “Anything rhymes if you make up the words.” But there are a bunch of other good ones. Here in Michigan, there is no “normal” weather — December sub-zero wind chills or shirt-sleeve weather are within the range I’ve experienced in my 60+ (often) odd years. It makes it hard to judge climate vagaries, especially when the remedies pushed include the “carbon tax,” another scam for the wealthy to wheel and deal out of responsibility, instead of being made to clean up their messes. 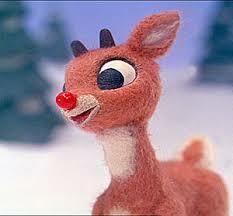 Rudolph is a weird cartoon, isn’t it? My preference is the original Grinch cartoon, or Mr. Magoo’s Christmas Carol. Rudolph is super-weird. I think it was weird even in its day (or my days for watching it, the 1970s), but today’s young children are extremely bothered by the reindeer Coach and Santa’s encouragement of bullying and ostracizing Rudolph for his nose. Rightfully so! The best Rudolph I’ve seen is on the downslope to the Eno River bridge on NC157 where someone has placed a small round red reflector at the end of the deer’s nose on a highway warning sign. It’s at the exact perfect location. However, there’s no place to park and take a photo.